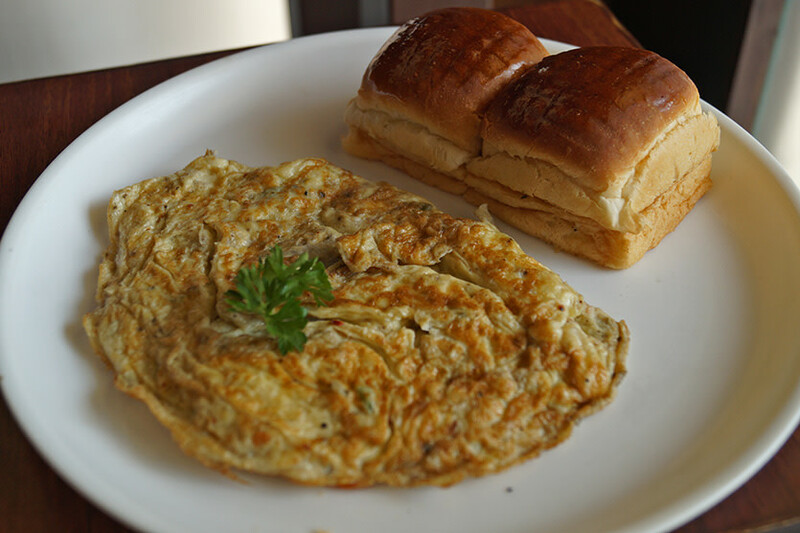 The bustling metropolis of Delhi has a lot to offer, especially when it comes to good food! The only thing that deprives us of that is the robust will and dedication to search for hidden gems serving some of the most delectable items in town. And it was exactly the same will which led us to this treasure in East Delhi going by the name of Cafetorium. Nestled in the heart of D-Block Market in Vivek Vihar, this cutesy little café possess a subtle vibe owing to its yellow and brown theme. 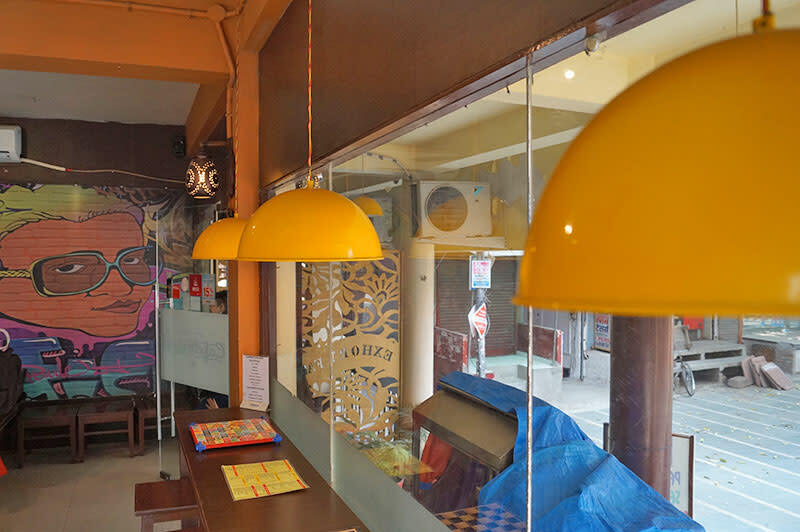 A short flight of stairs takes you to the entrance where one side of the wall is decorated with funky graffiti and short stools and tables are laid out for hungry patrons. The walls of the café are adorned with posters of various music bands and popular sitcoms. Hygiene being their utmost priority, they aim at serving their customers in the most sanitized environment. We went for our all-time fave drink, Cold Coffee With Ice-Cream! 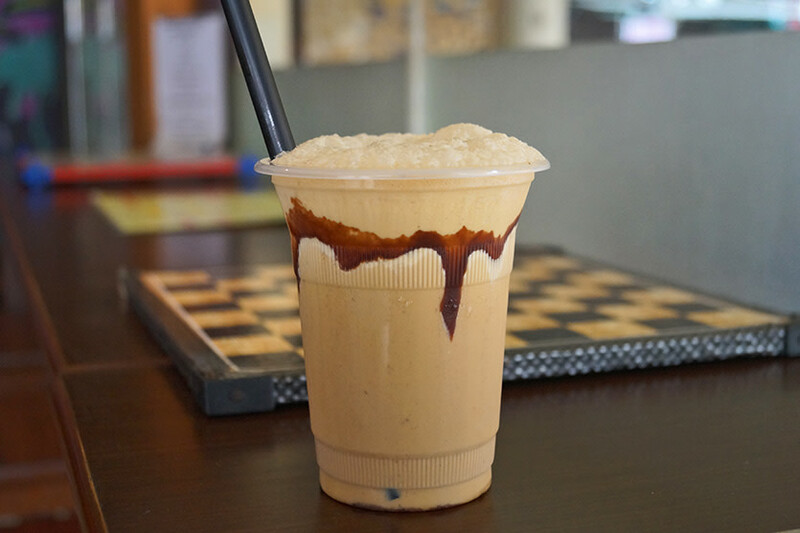 Toned milk, sugar syrup and two scoops of coffee powder were blended together to result in our drink which was then topped with a dollop of vanilla ice-cream. Though the coffee was a tad high on sweetness owing to the ice-cream, yet the essence of powdered cocoa easily made the drink slurp-worthy! Eggs are the most experimented-with ingredients and we were curious to know how Cafetorium does ‘em. Two whole eggs blended with diced onions, tomatoes, capsicums, red and yellow bell peppers with apt amount of salt and pepper were cooked well till golden brown to form the omelette which was served with two pieces of pavs grilled with butter and garnished with coriander. The omelette had to be tucked in between the pavs before devouring them. Complementing its name, the dish was high on masala and though the dish was a relatively simple one, it did make its way to our recommendation list of must-haves here! Though this item was not mentioned on their menu, yet this was the most sought after dish! 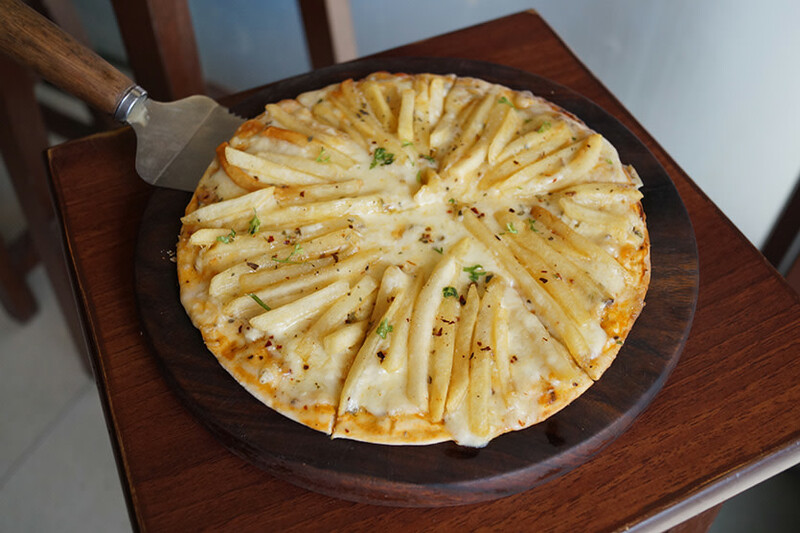 Served on a wooden pizza bat, we had a 9’’ pizza with a super thin crust with a topping of diced onions, oodles of mozzarella cheese and French fries! Oregano and chili flakes were moderately used along with other spices, and the essence of these were felt prominently. The fries that adorned the top of the pizza had a perfect crisp on the outside and were moist on the inside, making our love for this pizza go a notch higher. Bite into this for a foodgasm peeps! This item was the chef’s suggestion and we were all geared up to try it out. A handsome amount of penne pasta, evenly boiled, was beautifully stirred in alfredo sauce along with broccoli, capsicums and yellow bell peppers in a unique blend of spices with oregano acting as the catalyst in enhancing the overall taste of the dish. 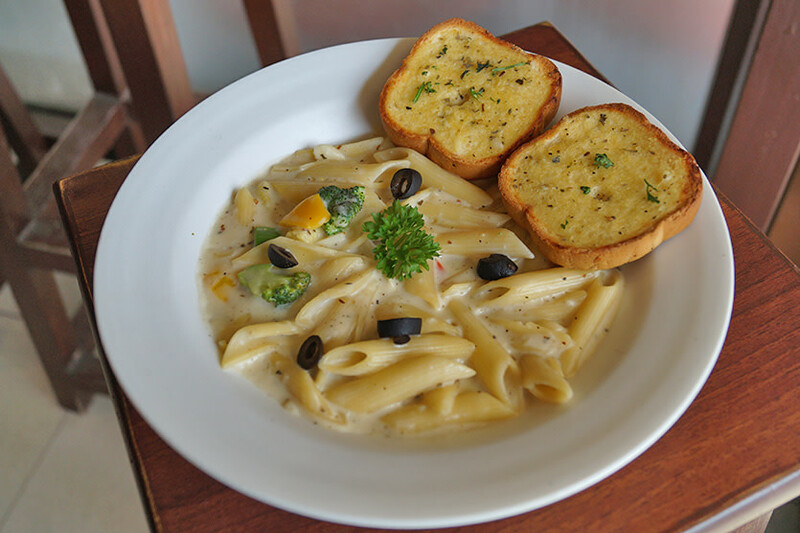 Served with two portions of garlic bread and garnished with diced black olives, this dish already had us drooling all over it. The breads had a nice crisp with the essence of garlic prevailing all over and combining it with the pasta left us utterly satiated! 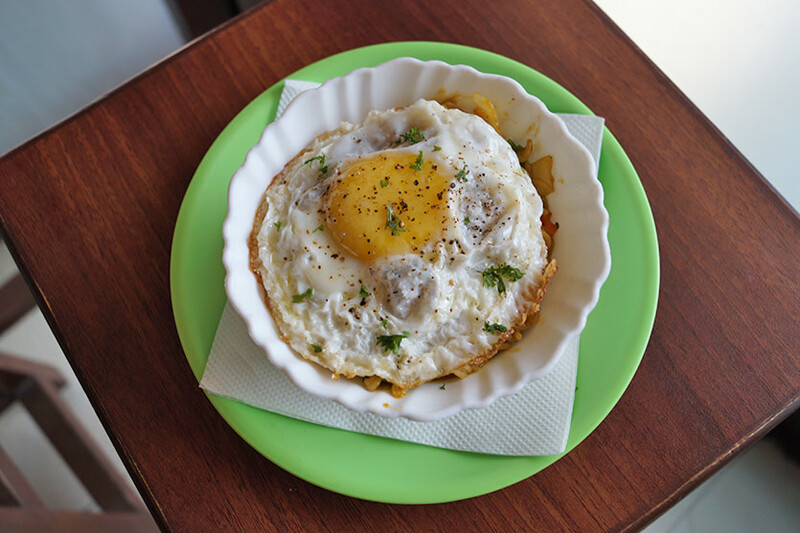 This was another experiment done by the café where a bowl of Maggi was presented with half a fried egg done sunny side up. The paste of garlic and green chillies along with some red chilli powder and salt was used while cooking Maggi instead of the regular tastemaker, enhancing the flavour of Maggi to the core. The vivacity of the spices could be felt in every single morsel we tasted. The half fried egg was again beautifully done and was kept bland so as to compensate the high spice quotient in the Maggi. Defo go for this one here! One of the most ordered item off their menu was this one! 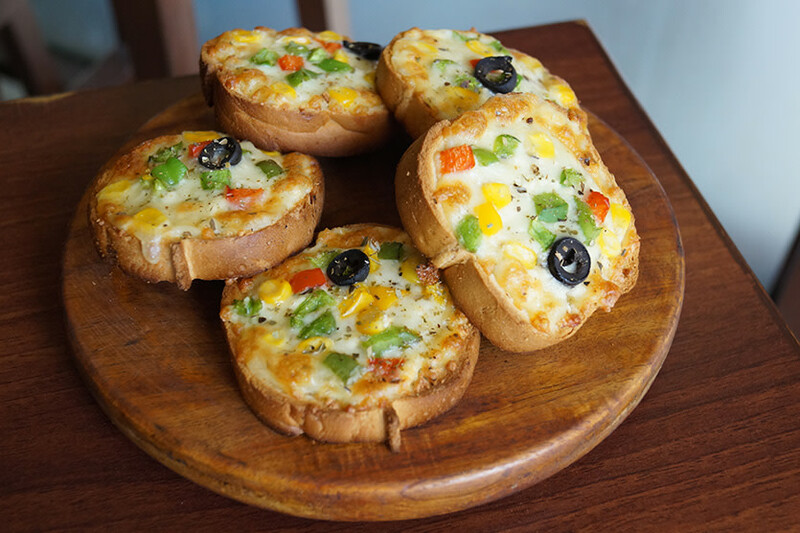 Five enormous pieces of round garlic bread loaded with diced onions, capsicums, red and yellow bell peppers and black olives with ample amount of mozzarella cheese were baked to perfection so as to form a nice and sturdy crisp on the base before being served to us. The spirit of garlic was quite dominant with a hint of oregano and black pepper playing their respective roles in augmenting the overall taste of the dish. The breads seemed fresh and with the presence of abundant cheese, we were head over heels for this place! All in all, the place can turn out to be an amazing chilling spot! One can also indulge in board games kept here to ensure the guests have a gala time. Scrumptious food and a rejuvenating plus pocket-friendly prices - come on by!